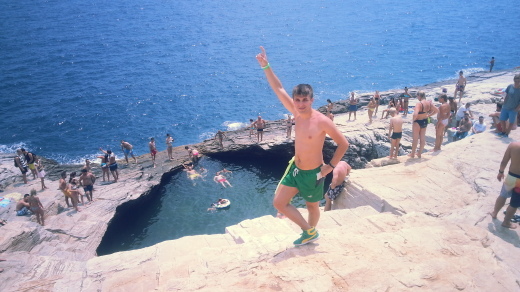 The Giola – one of the famous and of the most strange landmarks of Thassos. Thassos Island located in Greece in the northernmost part of the Aegean Sea quite close to the mainland is an island that boasts of lush greenery and crystal beaches. It is an ideal vacation spot for families or when you just want to relax. The gorgeous beaches found here are either totally secluded or organized. You will also love the mountainous villages found in the island featuring traditional architecture, with stone houses, grey-tiled floors and paved streets. Surrounding landscape is also ideal for trekking with paths that lead to caves, castle ruins and abandoned places. While there are numerous sights you can see and activities that you can take part in, one of the places that everyone should visit is Thassos Giola – the natural stone pool. 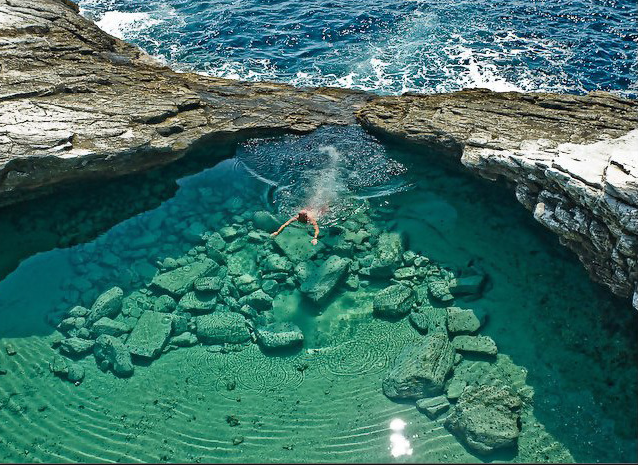 This is an incredible landmark where a natural stone pool was carved by sea water on the rock face. To get here, you will enjoy the interesting walk down the mountains to sea level which can be quite difficult as you have to go there by foot even though it can be seen from the road. Be assured however that it is a breathtaking view that is definitely worth it. It can be described as an almost circular pool that is approximately 3-4 m deep and 10 m deep and water comes in from the waves. If you are looking for a place to enjoy great peace of mind and relax without any distractions thassos giola – the natural stone pool is the perfect spot. This is a place where you can swim, dive and climb in the hot waters as it is heated continually by sea. You have to jump in to enjoy the waters as the walls of the pool are littered with numerous sea urchins. Tourists refer to the beautiful lagoon that is carved on the rocks a mermaid pool. The waters are a gorgeous turquoise color and crystal clear. 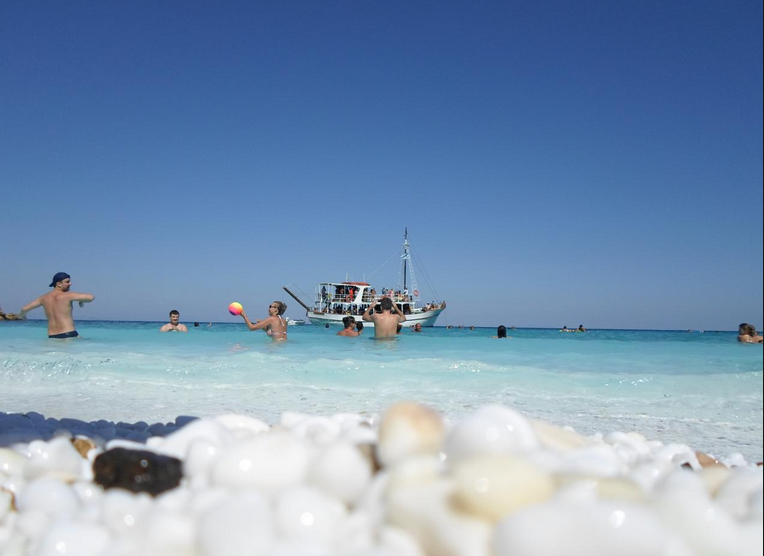 On the east coast of Thasos lies Saliara beach, also known as the Marble Beach. It derives its name from its splendid white sandy beaches and marble pebbles that grace its seafloor. Its unique waters that are white-blue in color are the perfect definition of a tropical beach vacation. The white sands still remain cool even in the hottest of days, thanks to the small pieces of marble in it. Thasos Marble beach is located in a tiny secluded bay. You can access it via the Makriammos beach, which is 9 km from Limenas. Take the dirt road that is located near the entrance of Makyammos Hotel. After 5km you will be able to see Saliara beach. Make sure you drive slowly for the road is filled with lots of potholes. Many people make their way to this magnificent beach every year. What used to be a wild and untapped beach is now a family friendly and very popular beach perfect for a summer vacation. There are tons of activities you can indulge in. You can enjoy diving in the clear blue waters, swimming, sport fishing, kayaking, surfing and snorkeling. If you are in the mood of doing absolutely nothing you can delight in basking under the warm sun. Thasos Marble beach is surrounded by many stunning features. You and your family can enjoy sightseeing the nearby attractions such as the Archaeological museum, the Folklore museum of Limenaria, a monastery built in 1987, Kastro village and the isle of Krambousa. You can also explore the nearby charming villages and islands. This charming beach has something for everyone to delight in. If you happen to be in Greece, don’t forget to visit this little piece of heaven on earth. The weather is delightful all year round. Summer is the best time to visit for there are plenty of activities to do.